This is one of the more impressively eccentric events on the European calendar. 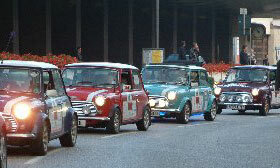 Inspired by 1969 film The Italian Job, a sponsored Mini Cooper rally heads across the Alps to Italy's Emilia Romagna region, picks up a load of the local wine and then heads back to the UK to auction the booty - with the proceeds going to a range of children's charities. The Noel Coward behind this particular caper is Freddie St George, the Brighton-based Mini nut, film fan and ace PR man who first came up with the idea in 1990. 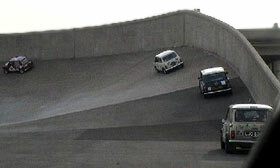 It was supposed to be a one-off event, but such was the response from the Mini-driving community that the Italian Job has now become an annual fixture. Over the years, the event has attracted participants from Europe, America, New Zealand and even Japan; and the intrepid men in their motoring machines have raised more than £1 million for children's charities. Michael Caine himself is one of the event's patrons. You'd need a big coach for this lot! Each team of drivers (usually two per car) is required to raise £1500 for the event's nominated charities. Minis are the cars of choice, but any car which featured in the 1969 film can be used - Aston Martin DB4s, E-type Jags and Alfa Giulia police cars have all taken place in previous rallies. Each team makes its own way to Italy, where the final destination is Imola in Emilia Romagna. Here the drivers converge on the town and take part in a four-day navigational rally and plenty of celebrating, culminating in a special lap of honour at the Imola racing circuit. On the way back the event follows a strict itinerary, with drivers being required to make all the necessary pit-stops. The Italian part of the Job features visits to Rimini and San Marino. 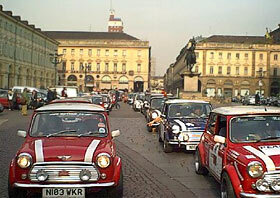 When passing through Turin, they stay at the old Fiat Factory, which is now a five-star deluxe hotel, where the test track on the roof sees minis in circuit just as it did in the actual movie. Next it's on to Beaune in France for some wine tasting, before continuing up to Paris and finally Ashford in Kent for a celebratory dinner. Cost: Registration fee £500 (one car and two persons) - but please check with the organisers. You get to stay in the Lingotto Hotel, formerly the Fiat factory with the track on top! If you are worried about breakdown, don't be - the tour has fully equipped support vans and experts in Mini's, keeping you running smoothly all the way.